Crater Lake National Park is a United States National Park located in southern Oregon; the only national park in the state. It was established on May 22, 1902, by President Theodore Roosevelt, as the nation's sixth designated National Park. The park covers 286 square miles (741 km²). Since its creation, the national park status has helped protect both the Native American cultural ties to the area and the natural habitat of the plant and animal life found within its boundaries. The park is on the crest of the Cascade Mountain Range, 100 miles (160 km) east of the Pacific Ocean. 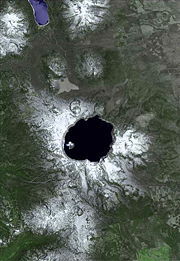 The collapse of the 12,000 feet (3,700 m) Mount Mazama following a violent eruption 7,700 years ago created a basin which filled and became Crater Lake, the park's primary feature. Crater Lake has no inlets or outlets and is filled entirely from direct precipitation in the form of snow and rain. All water that enters the lake is lost from evaporation or subsurface seepage. It is thus environmentally protected and its waters, in terms of the absence of pollutants, are some of the purest in North America. The lake is 5 by 6 miles (8 by 9.6 km) across with an average depth of 1,148 feet (350 m). Its deepest point has been measured at 1,949 feet (594 m). Crater Lake the deepest lake in the United States, the second deepest in North America after Canada's Great Slave Lake. It ranks ninth deepest lake in the world. However, on the basis of comparing average depths among the world's deepest lakes, Crater Lake is the deepest lake in the Western Hemisphere and the third deepest in the world. The lake is surrounded by sheer cliffs—some of them 2,000 feet (610 m) high—and contains two picturesque islands. The mountain air is notably clear and crisp. It has long been considered holy by Native Americans and is today respected as a sacred site to non-Natives as well. It is famous for its deep blue color and water clarity. Mount Mazama collapsed a large caldera, which was later filled with Crater Lake. Mount Mazama is a destroyed stratovolcano in the Oregon part of the Cascade Volcanic Arc and the Cascade Range. The volcano's collapsed caldera holds Crater Lake, and the entire mountain is located in Crater Lake National Park. Mount Mazama was built up mostly of andesite, dacite, and rhyodacite over a period of at least 400,000 years. It is most famous for a catastrophic volcanic eruption that occurred around 5,677 B.C.E. The eruption, estimated to have been 42 times more powerful than Mount St. Helens' 1980 blast, reduced Mazama's approximate 11,000-foot (3,400 m) height by around half a mile (800 m) when much of the volcano fell into the volcano's partially emptied neck and magma chamber. About 50 cubic kilometers (12 cubic miles) of rhyodacite was erupted in this event. Since that time, all eruptions on Mazama have been confined to the caldera. At 8,159 feet (2,487 m), Hillman Peak is now the highest point on the rim. 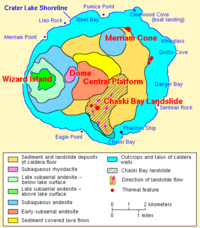 Lava eruptions later created a central platform, Wizard Island, Merriam Cone, and other, smaller volcanic features, including a rhyodacite dome that was eventually created atop the central platform. Sediments and landslide debris also covered the caldera floor. In time, the caldera cooled, allowing rain and snow to accumulate and eventually form a lake. Landslides from the caldera rim thereafter formed debris fans and turbidite sediments on the lake bed. Fumaroles and hot springs remained common and active during this period. Also after some time, the slopes of the lake's caldera rim more or less stabilized, streams restored a radial drainage pattern on the mountain, and dense forests began to revegetate the barren landscape. It is estimated that about 720 years was required to fill the lake to its present depth of 594 m. Much of this occurred during a period when the prevailing climate was less moist than at present. Some hydrothermal activity remains along the lake floor, suggesting that at some time in the future Mazama may erupt once again. Panoramic view of Crater Lake, with a portion of the original mountain's surface profile seen at left. A view of the clear blue water of Crater Lake. Crater Lake is a caldera lake created by the eruption of Mount Mazama, partly filling the nearly 4,000 foot (1,220 m) deep caldera that was formed by the collapse of the volcano. It is the main feature of Crater Lake National Park and is famous for its deep blue color and water clarity. The lake is 5 by 6 miles (8 by 9.6 km) across with an average depth of 1,148 feet (350 m). Its deepest point has been measured at 1,949 feet (594 m), though as with any lake its depth fluctuates with the climate, particularly rainfall. This makes Crater Lake the deepest lake in the United States, the second deepest lake in North America (Great Slave Lake is the deepest), and the ninth deepest lake in the world (Lake Baikal is the deepest). Crater Lake is often cited as the 7th deepest lake in the world, but this result excludes the recent discovery of subglacial Lake Vostok, which is situated under nearly 13,000 feet (4000 m) of Antarctic ice, and the recent soundings of O'Higgins/San Martín Lake, which is located on the border of Chile and Argentina. However, on the basis of comparing average depths among the world's deepest lakes, Crater Lake becomes the deepest lake in the Western Hemisphere and the third deepest in the world. Comparing average depths among the world's lakes whose basins are entirely above sea level, Crater Lake is the deepest. Only Lakes Baikal and Tanganyika have average depths which are greater than that of Crater Lake, but their basins extend below sea level. Lake Issyk Kul has a basin that is entirely above sea level and has a greater maximum depth, but its average depth is less than that of Crater Lake. The caldera rim of Crater Lake ranges in elevation from 7,000 to 8,000 feet (2,130 to 2,440 m). Due to several unique factors, most prominently that it has no inlets or tributaries, the waters of Crater Lake are some of the purest in terms of the absence of pollutants in North America. Secchi disk clarity readings have consistently been in the high-20 meter to mid-30 meter (80–115 ft) range, which is very clear for any natural body of water. In 1997, scientists recorded a record clarity of 43.3 meters (142 ft). The lake has relatively high levels of dissolved salts, total alkalinity, and conductivity. The average pH has generally ranged between 7 and 8. Having no indigenous fish population, the lake was stocked from 1888 to 1941 with a variety of fish. Of these, several species have formed self sustaining populations. Volcanic activity in the area is fed by subduction off the coast of Oregon as the Juan de Fuca Plate slips below the North American Plate (see plate tectonics). Heat and compression generated by this movement has created a mountain chain topped by a series of volcanoes, which together are called the Cascade Range. The large volcanoes in the range are called the High Cascades. However, there are many other volcanoes in the range as well, most of which are much smaller. There are at least 13 cinder cones in the park, and at least another 11 or so outside its borders, that still retain their distinctive cinder cone appearance. Though much younger than Mount Mazama, there continues to be debate as to whether these minor volcanoes and vents were parasitic to Mazama's magma chamber and system or if they were related to background Oregon Cascade volcanism. The eruptive period that decapitated Mazama also laid waste to much of the greater Crater Lake area and deposited ash as far east as the northwest corner of what is now Yellowstone National Park, as far south as central Nevada, and as far north as southern British Columbia. It produced more than 150 times as much ash as the May 1980 eruption of Mount St. Helens. This ash has since developed a soil type called andisol. Soils in Crater Lake National Park are brown, dark brown or dark grayish brown sandy loams or loamy sands which have plentiful cobbles, gravel and stones. They are slightly to moderately acidic and their drainage is somewhat excessive or excessive. Pinnacles, snow and pine trees at Crater Lake National Park. The climate at Crater Lake National Park provides a dramatic backdrop for the strikingly clear blue waters of the lake. Snow begins to accumulate in October and remains, in most places, until the following June. The annual average snowfall is 533 inches (1,350 cm), and by early spring it is not uncommon to have ten to fifteen feet (4 meters) of snow on the ground. While snowfall is common in the Cascade Mountains, Crater Lake National Park is one of the snowiest areas in the Northwest where regular records are kept. The most snow ever recorded on the ground at Park Headquarters was 21 feet (6.4 meters), on April 3, 1983. The months of May and June vary widely in temperature ranges, which can be as high as 65°F (18°C) or as low as freezing. Dry warm weather occurs July through September, though the temperaturs can still range from 40°F to 80°F or more (4°C to 27°C). Dramatic thunderstorms take place during this period, with powerful displays of lightning and high winds. The protected wilderness of the park is home to bears, deer, eagles, grouse, hawks, and owls. There is an abundance of songbirds and insectivorous birds during the summer months. Trout and salmon are the major fish species in the lake. Though originally introduced by humans, they have adapted to the lake and now thrive naturally. Plant life is predominantly pine and fir trees, with wildflowers covering the meadows in summer. The Native American Klamath tribe are believed to have witnessed the collapse of Mount Mazama and the formation of Crater Lake, and kept the event alive through their legends. One ancient legend of the Klamath closely parallels the geologic story which emerges from today's scientific research. The legend tells of two Chiefs, Llao of the Below World and Skell of the Above World, pitted in a battle which resulted in the destruction of Llao's home, Mount Mazama. 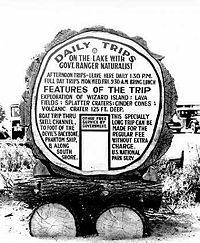 The first known non-Native people to visit the lake were a trio of gold prospectors: John Wesley Hillman, Henry Klippel, and Isaac Skeeters who, on June 12, 1853, stumbled upon the long, sloping mountain while looking for a lost mine. Stunned by vibrant blue color of the lake, they named the indigo body of water "Deep Blue Lake" and the place on the southwest side of the rim from which they first saw the lake became known as Discovery Point. The lake was renamed at least three times, as Blue Lake, Lake Majesty, and finally Crater Lake. In 1870, Crater Lake caught the attention of William Gladstone Steel, who devoted his life and fortune to the establishment and management of a National Park at the lake. In his efforts to bring recognition to the region, he participated in lake surveys that provided scientific support. He named many of the lake's landmarks, including Wizard Island, Llao Rock, and Skell Head. With the help of geologist Clarence Dutton, Steel organized a USGS expedition to study the lake in 1886. The party carried the Cleetwood, a half-ton survey boat, up the steep slopes of the mountain then lowered it to the lake. From the stern of the Cleetwood, a piece of pipe on the end of a spool of piano wire sounded the depth of the lake at 168 different points. Their deepest sounding, 1,996 feet (608 m), was very close to the modern official depth of 1,932 feet (589 m) (made in 1953, by sonar). At the same time, a topographer surveyed the area and created the first professional map of the Crater Lake area. Partly based on data from the expedition and lobbying from Steel and others, Crater Lake National Park was established May 22, 1902 by President Theodore Roosevelt. Steel's continued commitment to the area saw the creation of Crater Lake Lodge in 1915 and the Rim Drive in 1918. Highways were later built to the park to help facilitate visitation. 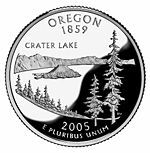 In 2005, the commemorative Oregon State Quarter was released under the U.S. Mint's 50 State Quarters Program. It features an image of Crater Lake on its reverse side and incorporates Wizard Island, as well as Watchman and Hillman Peaks on the lake’s rim and conifers. The coin bears the inscription "Crater Lake." The Pumice Desert: A very thick layer of pumice and ash leading away from Mazama in a northerly direction. Even after thousands of years, this area is largely devoid of plants due to excessive porosity and poor soil composed primarily of regolith. The Pinnacles: When the very hot ash and pumice came to rest near the volcano, it formed 200 to 300-foot (60 to 90 m) thick gas-charged deposits. For years afterward, hot gas moved to the surface and slowly cemented ash and pumice together in channels and escaped through fumaroles. Erosion later removed most of the surrounding loose ash and pumice, leaving tall pinnacles and spires. Mount Scott is a steep andesitic cone whose lava came from magma from Mazama's magma chamber; geologists call such volcano a "parasitic" or "satellite" cone. Volcanic eruptions apparently ceased on Scott sometime before the end of the Pleistocene; one remaining large cirque on Scott's northwest side was left unmodified by post-ice age volcanism. In the southwest corner of the park stands Union Peak, an extinct volcano whose primary remains consist of a large volcanic plug, which is lava that solidified in the volcano's neck. Crater Peak is a shield volcano primarily made of andesite and basalt lava flows topped by andesitic and dacite tephra. Timber Crater is a shield volcano located in the northeast corner of the park. Like Crater Peak, it is made of basaltic and andesitic lava flows, but, unlike Crater, it is topped by two cinder cones. Rim Drive is the most popular road in the park; it follows a scenic route around the caldera rim. The Pacific Crest Trail, a 2,650-mile (4,260 km) long distance hiking and equestrian trail that stretches from the Mexican to Canadian borders, passes through the park. Crater Lake National Park features many hiking trails and several campgrounds. Unlicensed fishing is allowed without limitation of size, species or quantity. The lake, with no indigenous fish, was stocked from 1888 until 1941. Kokanee Salmon (Oncorhynchus nerka) and Rainbow Trout (Oncorhynchus mykiss) now thrive naturally. Swimming is allowed in the lake, and boat tours operate daily during the summer, stopping at Wizard Island, a cinder cone inside the lake. All lake access is from Cleatwood Trail, a steep walking trail. Observation points along the caldera rim are easily accessible by car via Rim Drive, which is 33 miles (53 km) in length and has an elevation gain of 3,800 feet (1,200 m). The highest point in the park is Mt. Scott, 8,929 feet (2,722 m). Getting there requires a fairly steep 2.5-mile (4.0 km) hike from the Rim Drive trailhead. On a clear day from Mt. Scott's summit, visibility exceeds 100 miles (160 km) and can, in one single view, take in the entire caldera. 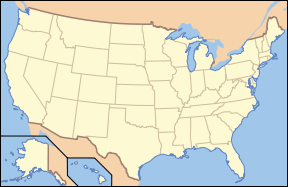 Also visible from this point are white peaked High Cascade volcanoes to the north, the Columbia River Plateau to the east, and the Western Cascades and the more distant Klamath Mountains to the west. Crater Lake's features are fully accessible during the summer months, though heavy snow during the fall, winter, and spring forces road and trail closures, including popular Rim Drive. ↑ C. M. Zdanowicz, G. A. Zielinski, and M. S. Germani. Geology; July 1999; v. 27; no. 7; p. 621-624. Mount Mazama eruption; calendrical age verified and atmospheric impact assessed, Geological Society of America. Retrieved October 10, 2008. ↑ Global Volcanism Program, Crater Lake. Retrieved October 10, 2008. ↑ Charles R. Bacon, James V. Gardner, Larry A. Mayer, Mark W. Buktenica, Peter Dartnell, David W. Ramsey, Joel E. Robinson, "Morphology, volcanism, and mass wasting in Crater Lake, Oregon," Geological Society of America Bulletin v. 114 p. 675-692. ↑ Manuel Nathenson, Charles R. Bacon, and David w. Ramsey, "Subaqueous geology and a filling model for Crater Lake, Oregon," Hydrobiologia v. 574, p. 13-27. ↑ U.S. Geological Survey, Geologic History of Crater Lake Retrieved October 10, 2008. 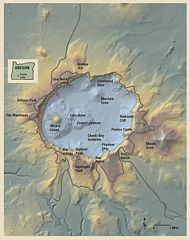 ↑ U.S. Geological Survey, Facts about Crater Lake. Retrieved October 10, 2008. ↑ Helen Gibbons, CMG Maps Bottom of Crater Lake, Oregon, U.S. Geological Survey. Retrieved October 10, 2008. ↑ Lee Juillerat, November 29, 2007, Into the Deep: Crater Lake's ranking as one of the world's deepest lakes varies by how list is determined, Klamath Falls Herald and News. Retrieved October 10, 2008. ↑ International Lake Environment Committee, World Lakes Database. Retrieved October 10, 2008. ↑ National Park Service, Facts and Figures about Crater Lake. Retrieved October 10, 2008. ↑ 11.0 11.1 National Park Service, The Fish of Crater Lake. Retrieved October 10, 2008. ↑ 12.0 12.1 National Park Service, Crater Lake Weather. Retrieved October 10, 2008. ↑ National Parks Service, Park History. Retrieved October 10, 2008. ↑ Sacred Destinations, Crater Lake, Oregon. Retrieved October 10, 2008. ↑ Freeman Tilden, The National Parks (New York: Alfred A. Knopf). ↑ H. John Runkel, "Crater Lake Discovery Centennial," Vol. XIX, Nature Notes from Crater Lake National Park, National Park Service. Retrieved October 10, 2008. ↑ U.S. Department of the Treasury, The Oregon Quarter. Retrieved October 10, 2008. Bacon, Charles R., James V. Gardner, Larry A. Mayer, Mark W. Buktenica, Peter Darnell, David W. Ramsey, Joel E. Robinson. "Morphology, volcanism, and mass wasting in Crater Lake, Oregon." Geological Society of America Bulletin 114(6): 675-692. Harmon, Rick. 2002. Crater Lake National Park: A History. Corvallis: Oregon State University Press. ISBN 0-87071-537-2. Harris, Ann G., Esther Tuttle, Sherwood D. Tuttle. 1997. Geology of National Parks: Fifth Edition Iowa: Kendall/Hunt Publishing. ISBN 0-7872-5353-7. Harris, Stephen L. 1988. Fire Mountains of the West: The Cascade and Mono Lake Volcanoes Missoula: Mountain Press Publishing Company. ISBN 0-87842-220-X. National Park Service. Crater Lake National Park. Retrieved October 10, 2008. History of "Crater Lake National Park"
This page was last modified on 9 December 2017, at 16:05.